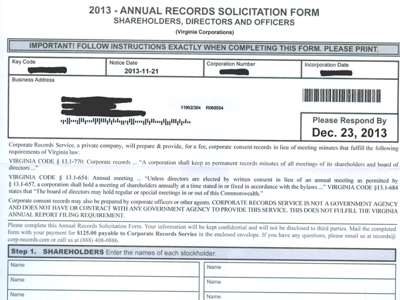 Although the solicitation contains a disclaimer stating that Corporate Records Service is not affiliated with a government agency, many customers may misinterpret the official-looking documents. Despite the implications contained in the solicitation, business entities are not required by law to file the statement with Corporate Records Service. The form is very professional looking. You are to fill out the form completely with the names of Shareholders, Corporate Directors, Corporate Officers and contact person. Than sent this information off to them with a check or money order for the amount of $125.00. made payable to Corporate Records Service. You do not have to do business with Corporate Records Service. The forms provided by Corporate Records Service are not required by any State. They are a dishonest scam trying to pose as a government entity just inside the law but their intent constitutes fraud. Government compliance is difficult enough without trying to separate what is and isn’t required.